Welcome to Full House Midwest. 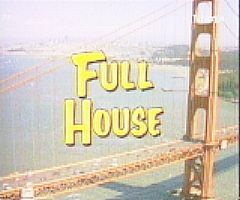 The #1 Site on the Web for everything Full House! Of cource If you've serfed on in to this site then you already know what Full House is but If for some weird reason you found this site by acident or were courcious then I'll explain what it is. Full House is a sitcom that aired on ABC from September 22 1987 to March 25 1995. It was created by Jeff Franklin in 1986. The Story is about a Father(Danny)who get help from his brother and law(Jessie) and his best friend (Joey), raising his three young daughters DJ, Stephanie, Michelle after his wife Pam died. Later on Jessie marries dannies co worker Becky, and they two twin boys, Nicky, and Alex. Also later on the Show we are introduced to Kimmie(DJ's best friend who lives next door", and Steve(DJ's boyfriend). This would also be a great place to include any new information or changesthat you have made to your site recently. It is important to regularlychange the content on your site and make updates to the informationthat you display. Doing this will help you to get more return visits from your visitors. Click on a charactors name to see pictures of that charactor. Sign my Guest Book won't you! If you have a Full House web site and want me to put it on my links page then eather email it to me with a discription of it or leave it along with a discription of it in my guest book. This would also be a great place to include any new information or changes that you havemade to your site recently. It is important to regularly change thecontent on your site and make updates to the information that youdisplay. Doing this will help you to get more return visits from your visitors.